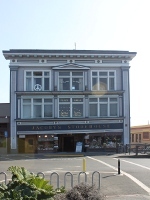 The basement and first story of this building were constructed in 1857 for Agustus Jacoby, and housed various mercantile firms during its early years as a principal supply point for the Klamath-Trinity mining camp trade. It served occasionally as a refuge in time of the Indian troubles from 1858 through 1864. 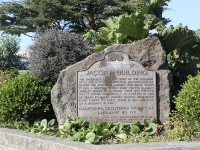 The official state marker plaque is located across the street at the northeast corner of the intersection.